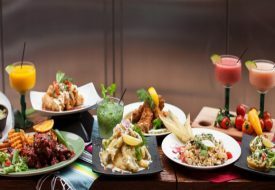 Planning for your big getaway during the June holidays? Here are five awesome hotels for an all-round fun and unforgettable time! Wherever you travel, your hotel can make or break a trip. So why not pick a memorable one that will have your travel companions raving for months on end? Take a break from rifling through the endless accommodation options. Check out (and check into) some of these exciting hotels around the world. They’re fun for the whole family, and will provide a more extraordinary experience than the typical luxurious stay in a five-star suite. 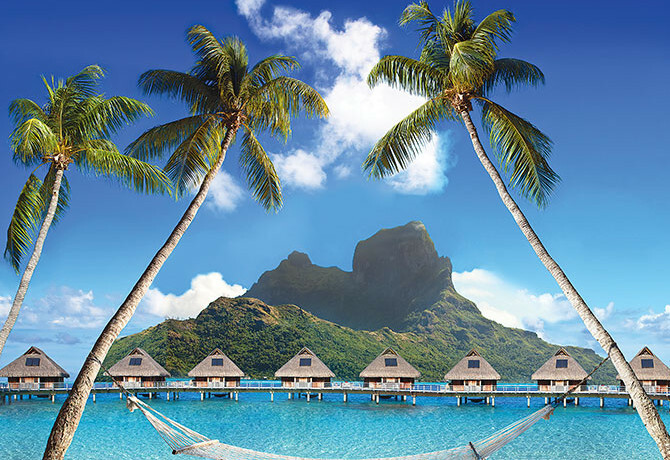 Unlike what its name says, this hotel is neither mobile nor on an island. 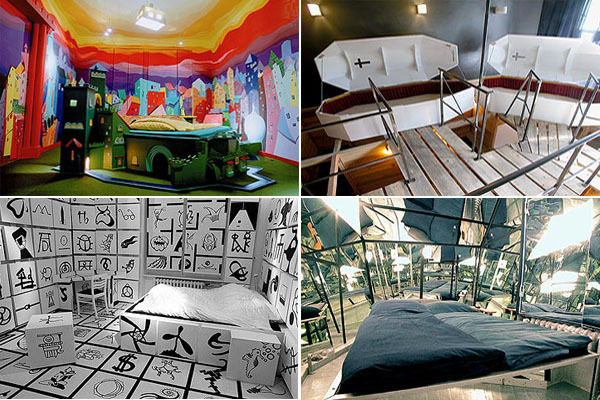 Also called Propeller Island City Lodge, this Berlin hotel offers 27 quirkily-themed rooms across a range of prices. Can’t get enough of yourself? 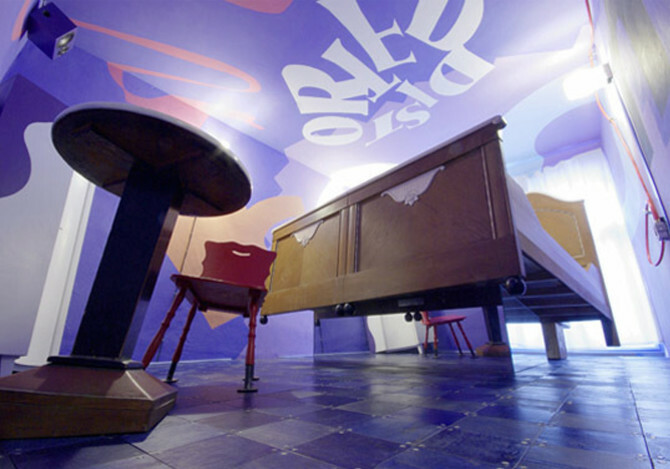 Bunk in the glimmering Mirror room. There’s even a mysterious Curry Chicken room, but not much information is available on that. I guess the only way to find out what it is would be to stay here! This might be one of the cutest guest houses in the United Kingdom! 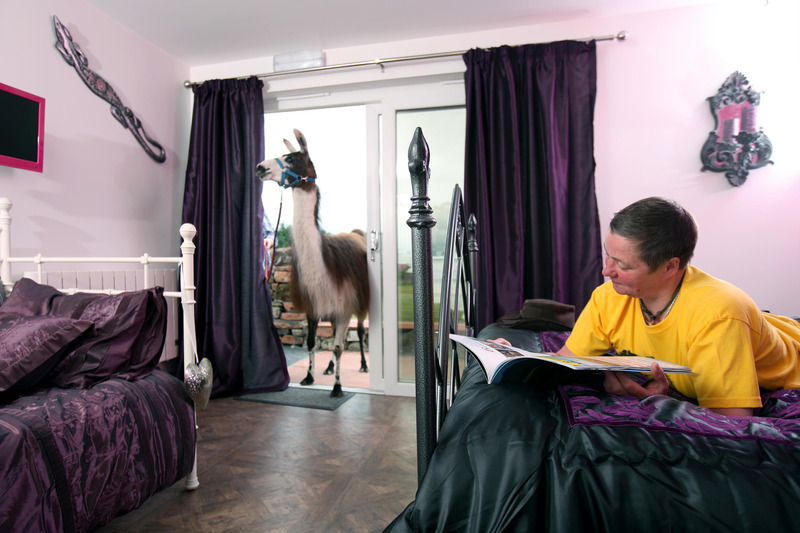 Situated in Penrith, a little market town in England near the English Lakes, The Llamas Pyjamas offers Peruvian-themed rooms, a relaxing café and a garden full of furry llamas. 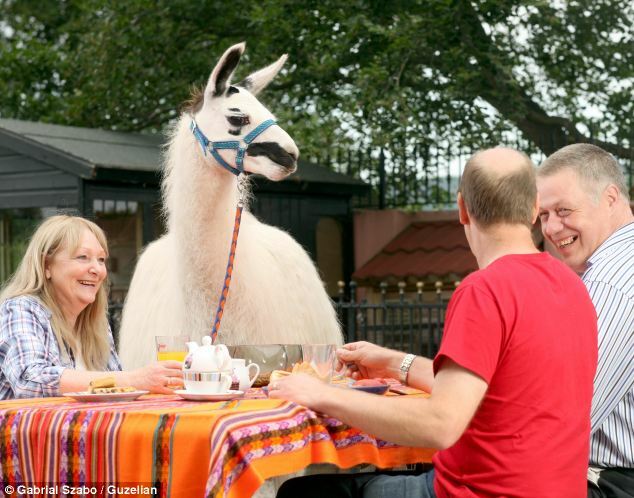 Here you and the kids can pet llamas, chat with llamas, trek with llamas, and just chill out with llamas in pyjamas. Well, you’d be the ones in pyjamas, because llamas don’t actually wear pyjamas. If you’re travelling with a group of six, you can stay at the cosy and quaint Barn Owl Cottage and admire the creatures that wander into the garden. There are also several nature walks offered here for you to interact with the wildlife of Penrith. Why choose a simple hotel room when you could be staying in your very own Hobbit hole? Woodlyn Park offers the world’s first Hobbit motel, a stretch of fully-equipped suites that look like the Hobbits of Middle Earth came and set up camp. Each unit can accommodate up to six people, and comes furnished with kitchen and bathroom facilities. Don’t worry though; the furniture and décor are all constructed to human scale! Not familiar with JRR Tolkien’s works? 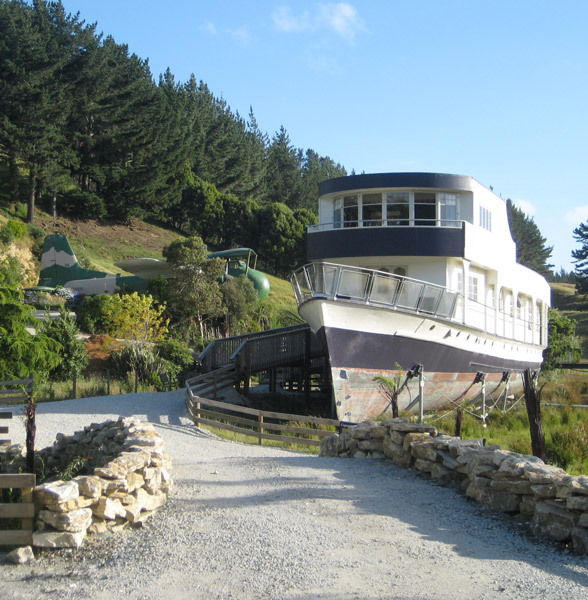 Woodlyn Park is also home to the equally-popular Train Carriage, the Waitanic Ship and Aeroplane Motels, where you can stay in life-sized replicas of these vehicles. 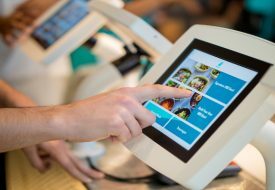 It’s sure to score points with the kids. 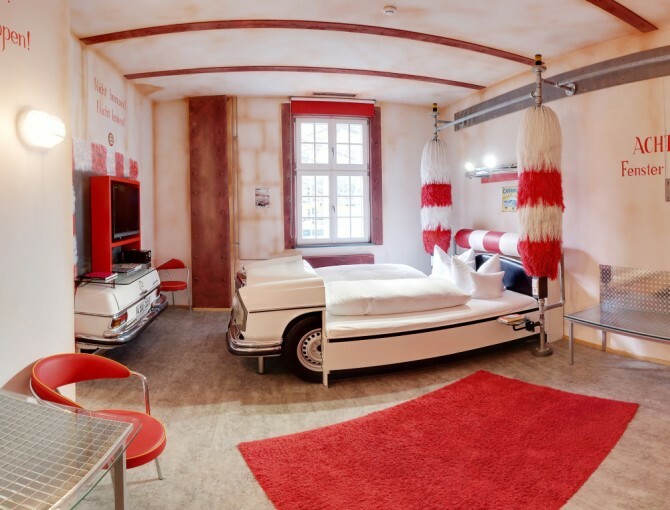 V8 Hotel, situated in the automotive epicentre of Stuttgart, Germany, is evidently very passionate about the local love for cars. 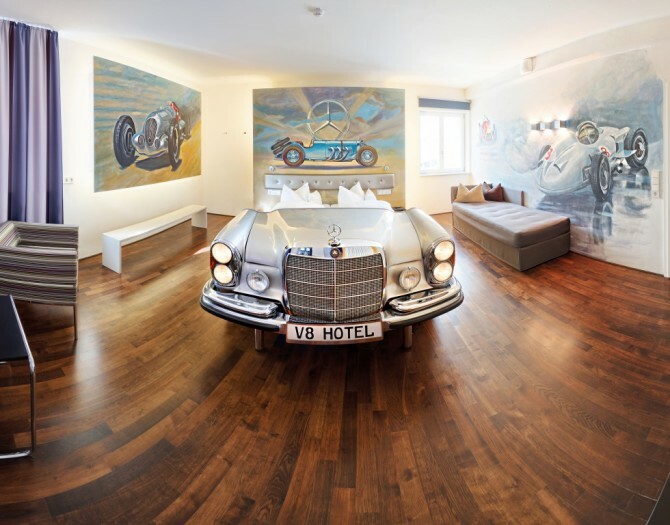 It’s brimming with automobile-themed rooms, legendary vintage car collections and classic cars – sure to set the hearts of automotive enthusiasts racing. 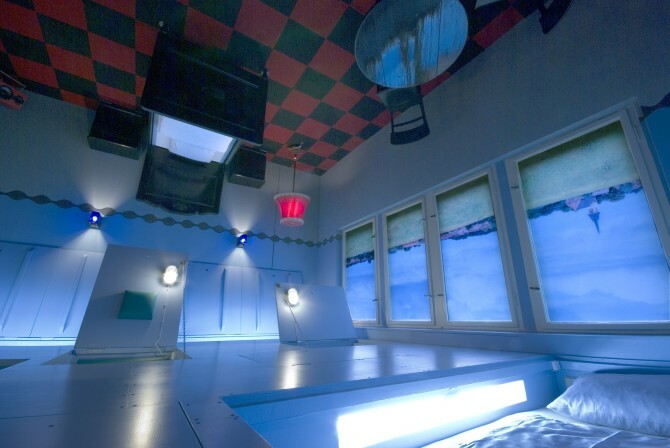 10 of its guest rooms are highly decorated, each with a unique charm of its own. 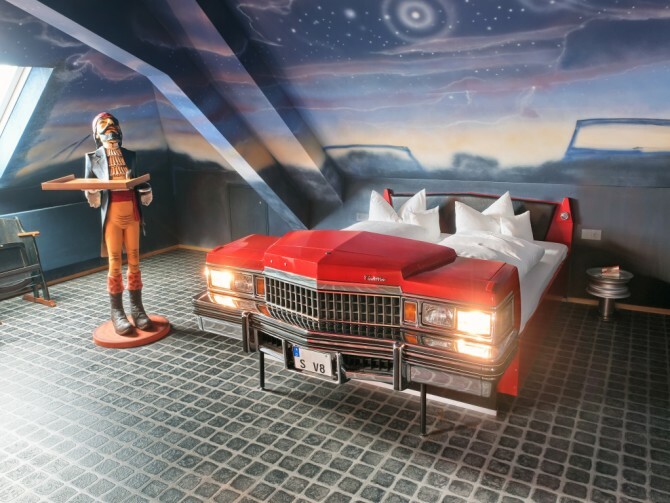 Be surrounded by the night sky as you camp out in a vintage car bed in the Drive In Cinema room, or revisit an old-school car wash in the Car Wash room! There’s a big discount for families, with extra beds or connected rooms upon request. And you thought car beds were only made for kids. It doesn’t sound very appealing, but getting drenched by Nick Slime is almost every child’s fantasy. The Nickelodeon Suites Resort is your chance to get slimed! Nick Slime is a signature gag of popular children’s channel Nickelodeon. You may recognise some of its series: Spongebob Squarepants, Dora the Explorer and Teenage Mutant Ninja Turtles. Of course, there are many other attractions here too, like a humungous waterpark, dining with characters, live performances by favourite characters and more. But most guests come here to get slimed, be it at a team challenge, poolside war or mass sliming. Don’t shy away from the gooey green stuff – your kids will enjoy the slime of a lifetime!